Note to readers: My friend Katie Rose Guest Pryal (who is also a talented novelist) and I are writing letters to each other on our blogs. I’m posting them here, and she’s also posting our letters on her site. Previous letters are in the archives. Remember that time we were both teaching English Comp? You lasted a whole lot longer than I did. We were a little out of touch for a while and I probably never told you about some of the odd jobs I did instead of teaching. And I mean “odd” in the strict sense of the word. Things got weird now and then. Don’t get me wrong. There are a lot of things I love about teaching. The adjunct mill wasn’t one of them. During grad school, I taught some classes to help with tuition. I also picked up other jobs. My art and writing degrees were supposed to help me get a job teaching one of those subjects while I worked on my own novels and artist books. It didn’t quite work out that way. Did I ever tell you about working in the veterinary clinic? I did that until they wanted me to insert things into cats. (I was their receptionist.) I worked as a contract archaeologist for a couple of years, which meant digging holes every thirty paces through fields and swampland (I had this delusion of being Indiana Jones). I slung coffee in cafes, filed papers in a university law office, worked in a chocolate shop, and when it closed moved to the factory. (It was not as funny as that episode of “I Love Lucy,” though I did manage to knock over an entire baker’s rack of chocolate truffles.) I was a studio coordinator, a retail clerk, a web illustrator, a teacher at a military academy in middle Georgia. I did data entry for tax forms, and sometimes I got lucky and taught letterpress-printing classes. Just yesterday I read a job posting for a creative writing instructor at my alma mater, and for a moment I thought about applying. Then I thought, “I’ve been out of the teaching game too long. They’d laugh at my resume.” And they might—it’s all over the place. But then I remembered that what’s happening now is the right speed for me. (Sometimes when the grass starts to look greener, you have to check around your own feet again.) I don’t want to worry about teaching loads anymore. I don’t have the resolve to grade the endless papers. I’d rather stand in the drizzling rain, watching kids get that look of wonder wash over them as they tug on my sleeve and ask what that big animal is strolling through the valley. If there’s one thing I’ve learned, it’s this: people can affect us deeply in the briefest of moments: a day, a week, a minute. I’ve got a long list of people who have affected me that way, so this “job” is a way for me to balance those scales. 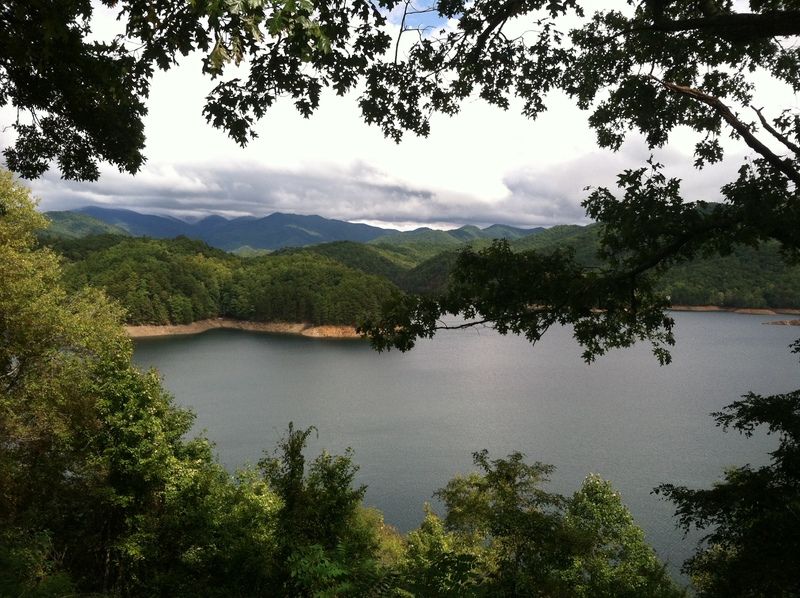 pictured above: a view from Fontana Lake, near the dam, in the Great Smoky Mountains National Park.